The IBM® System x3250 M3 is a single-socket server that offers new levels of performance and flexibility to help you respond quickly to changing business demands. Cost-effective and compact, it is well suited to small to mid-sized businesses, as well as large enterprises, whether for general-purpose workloads or specialized applications. The x3250 M3 is designed for infrastructure applications such as firewall, security, disaster recovery, name server, authentication, credit card processing, email, domain controller, and more. It leverages the latest dual-core and quad-core processor technology. Note: This product has been withdrawn from marketing and is no longer available for ordering from IBM. Suggested uses: Application Solution Providers and medium/large enterprises with space constrained data centers, SMBs, custom apps, e-mail/collaboration, file/name/print, security, web serving, or branch office solution. The IBM System x3250 M3 is a single-socket rack-mounted server that offers new levels of performance and flexibility to help you respond quickly to changing business demands. Cost-effective and compact, it is well-suited for small to mid-sized businesses, as well as large enterprises, whether for general-purpose workloads or specialized applications. The x3250 M3 helps you save on energy costs with features that support IBM Systems Director Active Energy Manager™ to let you monitor and control power consumption in your IT environment. An option to upgrade to a high-efficiency power supply is also available. The single-socket IBM System x3250 M3, incorporating IBM X-Architecture features, is an affordable, single-socket rack-mount server that offers more performance, configuration flexibility and availability features than many other servers in its class. From network infrastructure to distributed applications to front-end workloads, the x3250 M3 is designed to meet a wide range of business needs and help you adapt to changing business requirements. Supports a single processor, including the quad-core Intel® Xeon® 3400 Series processor, designed with fast 1333 MHz memory access and 8 MB of L3 cache, to help provide the computing power you need to match your business needs and growth. Six DIMMs of registered 1333 MHz DDR3 ECC memory provide speed, high availability. Supports up to 32 GB of memory with four 8GB DIMMs. High-performance 6 Gbps SAS RAID controllers and 15K RPM 6 Gbps SAS disk drives in a variety of capacities to suit your local storage requirements. The use of solid-state drives (SSDs) instead of or along with traditional spinning drives (HDDs) can significantly improve I/O performance. An SSD can support 20,000 I/O operations per second (IOPS) whereas a typical HDD handles fewer than 500 IOPS. A choice of 2-core or 4-core processors with clock rates up to 3.06 GHz. Six DIMM sockets allowing memory expansion of up to 48 GB. Seven USB 2.0 ports available - two front, four rear, and one internal for an embedded hypervisor. Storage bay flexibility: Up to two 3.5" simple-swap SATA or hot-swap SAS/SATA HDDs, or up to four 2.5" hot-swap SAS/SATA HDDs or SSDs. Additional internal optical drive bay. Direct-attach SAS storage with the EXP2512 and EXP2524 storage enclosures is supported. IBM System Storage servers, including network-attached storage (NAS), and iSCSI or Fibre Channel-attached storage, can also be attached. Two PCI Express 2.0 (PCIe 2.0) or PCI-X I/O slots for increased network or storage connectivity. One slot dedicated to the optional RAID controller. The x3250 M3 includes an Integrated Management Module (IMM) to monitor server availability, perform Predictive Failure Analysis, and trigger IBM Systems Director alerts. An optional Virtual Media Key enables additional systems management capabilities, including web-based out-of-band remote control (keyboard video and mouse), remote optical drive support, Windows “blue screen” error capture, and support for LDAP and SSL protocols. Text Console Redirection support allows the administrator to remotely view server text messages over Serial or LAN connections. Human readable event logs — no more beep codes. Complete out-of-band coverage by the Advance Settings Utility to simplify remote setup. A complete setup solution, allowing adapter configuration functions to be moved into UEFI. Integrated IPMI 2.0 support alerts IBM Systems Director to anomalous environmental factors, such as voltage and thermal conditions. It also supports highly secure remote power control using data encryption. IBM Systems Director is included for proactive systems management. IBM Systems Director comes with a portfolio of tools, including IBM Systems Director Active Energy Manager, IBM Service and Support Manager, and others. IBM Systems Director also offers extended systems management tools for additional server management and increased availability. When a problem is encountered, IBM Systems Director can issue administrator alerts via email, pager, and other methods. IBM Systems Director Active Energy Manager provides advanced power management features with actual real-time energy monitoring, reporting, and capping features. The server offers ECC memory protection. This can help reduce downtime caused by memory errors. Toolless cover removal provides easy access to upgrades and serviceable parts, such as HDDs and memory. Similarly, the Virtual Media Key and the ServeRAID controller can be installed and replaced without tools. This means less time (and therefore less money) spent servicing the x3200 M3. Toolless slides ship with the server, together with a cable management arm (CMA), that allows the rack server to easily slide into place. The three-year (parts and labor) limited onsite warranty provides peace of mind and greater investment protection than a one-year warranty does. Low-voltage processors draw less energy and produce less waste heat than high-voltage processors, thus helping to reduce data center energy costs. The available dual-core Xeon L3406 processor use only 30 W.
Optional solid-state drives (SSDs) use only 2 W of power per drive, compared to 9 - 10 W for 2.5-inch HDDs. This is as much as 80% less power than a 2.5-inch HDD would use, with a corresponding reduction in heat output that further improves the overall bottom line. Energy-efficient components, including low-voltage transistors and voltage regulator devices, and power supplies. The server uses hexagonal ventilation holes in the chassis. Hexagonal holes can be grouped more densely than round holes, providing more efficient airflow through the system chassis. This ultimately results in reduced operational costs. 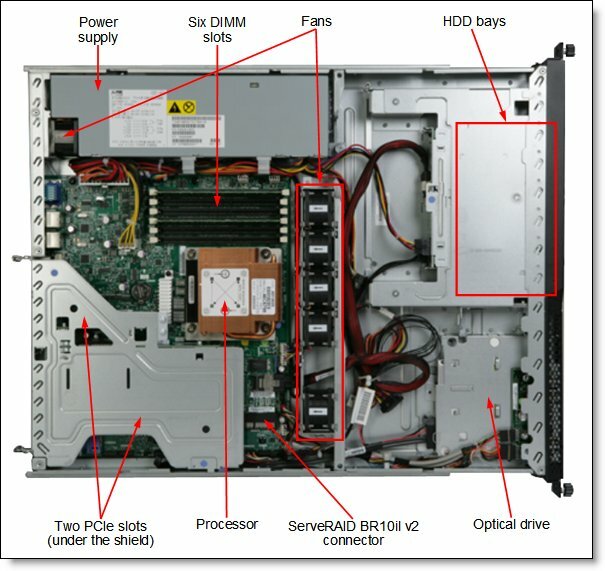 Figure 2 shows the front of the server. Processor One quad-core Intel Xeon 3400 series processor (up to 3.06 GHz/8 MB) or one dual-core Intel Core i3 series processor (up to 3.2 GHz/4 MB) with up to 1333 MHz memory speed, or one dual-core Intel Pentium G6950 (2.8 GHz/3 MB) or Celeron G1101 (2.26 GHz/2 MB) with up to 1066 MHz memory speed. Supports specific quad-core and dual-core processors via Configure-To-Order (CTO). Memory cache Up to 8 MB L3 for Intel Xeon 3400 series processors. Up to 4 MB L3 for Intel Core i3 series processors. Memory capacity Up to 32 GB with 8 GB DDR3 RDIMMs and four populated DIMM slots, or up to 16 GB with 4 GB DDR3 UDIMMs and four populated DIMM slots. Dual-core processors only support UDIMMs. Disk drive bays Up to two 3.5" simple-swap SATA HDDs, or up to two 3.5" hot-swap SAS/SATA HDDs, or up to four 2.5" hot-swap SAS/SATA HDDs or SATA SSDs (model dependent). Maximum internal storage Up to 2.4 TB with 600 GB SAS HDDs, or up to 4.0 TB with 2 TB SATA HDDs. Intermix of SAS/SATA is not supported. RAID Support No RAID support on integrated SATA controller (used on simple-swap standard models); RAID 0, 1, 1E with ServeRAID-BR10il v2 (used on hot-swap standard models). Optional RAID 5, 50 with ServeRAID M5014 or M5015. Optional upgrade to RAID 6, 60 is available for M5014 and M5015. Optical drive bays One, support for DVD-ROM or multiburner. Tape drive bays No internal tape drive support. Network interfaces Integrated 2 port Gigabit Ethernet/1 port is shared by IMM. The server has an additional internal PCI Express socket dedicated to use of the ServeRAID BR10il v2 controller if installed. External ports Two USB 2.0 ports on front. Four USB 2.0, one DB-15 video, one DB-9 serial, two RJ-45 Gigabit Ethernet network ports (1 is dedicated, 1 is shared with IMM) on rear. One internal USB port for embedded hypervisor. Cooling IBM Calibrated Vectored Cooling™ with 5 fans and N+1 redundancy. Power supply One fixed 351 W AC power supply (standard models) or one fixed 351 W AC HE power supply (only available via CTO). Systems management UEFI, IBM Integrated Management Module (IMM), Predictive Failure Analysis, Automatic Server Restart, IBM Systems Director* and IBM Systems Director Active Energy Manager, IBM ServerGuide. Optional Virtual Media Key for remote presence (graphics, keyboard and mouse, virtual media). Video Matrox G200e integrated into IMM, maximum resolution is 1024x768 @ 75 Hz. Microsoft Windows Server 2003, 2003 R2, 2008, 2008 R2, 2012. Red Hat Enterprise Linux, SUSE Linux Enterprise Server. VMware ESX 4/4.1, VMware ESXi 4/4.1, VMware vSphere 5/5.1. Limited warranty 1-year (4251) or 3-year (4252) customer replaceable unit and onsite limited warranty with 9x5/next business day (NBD) response time. Service and Support Optional service upgrades are available through IBM ServicePacs®: 24x7/NBD or 4 hours onsite repair, 1-year or 2-year warranty extension, remote technical support for IBM hardware and selected IBM and third-party (Microsoft, Linux, VMware) software. * Effective October 12, 2012, or until supply is depleted, IBM will discontinue the shipment of IBM Systems Director DVDs with IBM System x servers and IBM BladeCenter chassis. IBM Systems Director Express Edition and IBM Systems Director Standard Edition, which include software subscription and support, continue to be available for IBM System x servers and IBM Blade Centers. † The x3520 M3 is available as machine type 4251 with a 1-year warranty, or as machine type 4252 with a 3-year warranty. This is the only difference between systems of the same model (for example, comparing 4251-22x and 4252-22x). The server supports only one processor, which is already installed in a standard or configure-to-order (CTO) model. Standard models use processors as listed in the table. Where a model is not listed, that processor is only available via CTO or special bid. IBM DDR3 memory is compatibility tested and tuned for optimal System x performance and throughput. IBM memory specifications are integrated into the light path diagnostics for immediate system performance feedback and optimum system uptime. From a service and support standpoint, IBM memory automatically assumes the IBM system warranty, and IBM provides service and support worldwide. Mixing of UDIMMs and RDIMMs is not supported. RDIMMs are only supported with Intel Xeon 3400 series processors. The following table lists the hard drive options available for internal disk storage in the x3250 M3 server. The intermixing of SAS and SATA drives is not supported. * This drive cannot be ordered separately. It is only available via special bid or the CTO process. The following table lists the RAID controllers and additional options used for internal disk storage of x3250 M3 server. * Note: The Advanced Feature Key and Performance Accelerator Key cannot be used at the same time. Only one key can be installed onto the RAID controller. The ServeRAID BR10il v2 controller occupies the dedicated PCI-E slot in the x3250 M3 and does not consume either of the regular PCI expansion slots. However, the M1015, M5014, or 5015 RAID controllers do occupy one of the standard PCI-E x8 Gen 2 slots, therefore limiting the maximum number of additional I/O adapters to one. Only one RAID controller can be used in the server to support the internal HDDs. The server does not support internal tape drive options. * This optical drive is for CTO orders only. The server has an additional PCI Express socket dedicated to use of the ServeRAID BR10il v2 controller if installed. x3250 M3 supports two integrated Gigabit Ethernet ports. One port is shared with IMM. The following table lists the storage host bus adapters (HBAs) supported by x3250 M3 server. The server does not support the High IOPS SSD adapters. The server supports one fixed 351 W AC power supply (standard models) or one fixed 351 W High Efficient AC power supply supported by IBM Systems Director Active Energy Manager (via CTO). Standard models ship with one 2.8 m C13 - C14 power cord. The server supports VMware ESXi installed on a USB memory key. The key is installed in a USB socket inside the server. The following table lists the virtualization option. The server contains IBM Integrated Management Module (IMM), which provides advanced service-processor control, monitoring, and alerting functions. If an environmental condition exceeds a threshold or if a system component fails, the IMM lights LEDs to help you diagnose the problem, records the error in the event log, and alerts you to the problem. Optionally, the IMM also provides a virtual presence capability for remote server management capabilities. The blue-screen capture feature captures the video display contents before the IMM restarts the server when the IMM detects an operating-system hang condition. A system administrator can use the blue-screen capture to assist in determining the cause of the hang condition. The following table lists the remote management option. The IBM System x3250 M3 has a 1-year (4251) or 3-year (4252) onsite warranty with 9x5/next business day terms. IBM offers warranty service upgrades through IBM ServicePacs. The IBM ServicePac is a series of prepackaged warranty maintenance upgrades and post-warranty maintenance agreements with a well-defined scope of services, including service hours, response time, term of service, and service agreement terms and conditions. IBM ServicePac offerings are country-specific. That is, each country might have its own service types, service levels, response times, and terms and conditions. Not all covered types of ServicePacs might be available in a particular country. For more information about IBM ServicePac offerings available in your country, see the IBM ServicePac Product Selector at https://www-304.ibm.com/sales/gss/download/spst/servicepac. Warranty service definitions are explained in more detail in the following table. IBM onsite repair (IOR) A service technician will come to the server's location for equipment repair. 24x7x2 hour A service technician is scheduled to arrive at your customer’s location within two hours after remote problem determination is completed. We provide service 24 hours per day, every day, including IBM holidays. 24x7x4 hour A service technician is scheduled to arrive at your customer’s location within four hours after remote problem determination is completed. We provide service around the clock, every day, including IBM holidays. 9x5x4 hour A service technician is scheduled to arrive at your customer’s location within four business hours after remote problem determination is completed. We provide service from 8:00 a.m. to 5:00 p.m. in the customer's local time zone, Monday through Friday, excluding IBM holidays. If after 1:00 p.m. it is determined that onsite service is required, the customer can expect the service technician to arrive the morning of the following business day. For noncritical service requests, a service technician will arrive by the end of the following business day. 9x5 next business day A service technician is scheduled to arrive at your customer’s location on the business day after we receive your call, following remote problem determination. We provide service from 8:00 a.m. to 5:00 p.m. in the customer's local time zone, Monday through Friday, excluding IBM holidays. The external disk storage expansion enclosures listed in the following table are supported with x3250 M3 server. The hard disk drives listed in the following table are supported with external expansion enclosures. The RAID controllers listed in the following table are supported with external expansion enclosures. The external SAS cables listed in the following table are supported with external expansion enclosures and M5025 RAID controllers. * Note: Multiple EXP3000 enclosures can be daisy-chained together, all connected to the one RAID controller. Each enclosure requires a cable. The following table lists the external storage systems that are supported by the server and can be ordered through System x sales channel. The server may support other IBM disk systems that are not listed in this table. Refer to IBM System Storage Interoperability Center for further information, http://www.ibm.com/systems/support/storage/ssic. * Note: The external tape drives listed can be ordered through System x sales channel. Server may support other IBM tape drives that are not listed in this table. Refer to IBM System Storage Interoperability Center for further information. † Note: These part numbers are the tape drives options for 35732UL and 35734UL. The server supports the top-of-rack Ethernet switches from IBM System Networking listed in the following table. The server supports attachments to the uninterruptible power supply (UPS) units listed in the following table. The server supports attachments to the power distribution units (PDUs) when installed in rack. IBM Global Financing can help you obtain the IT solution you need while preserving funding for other strategic investments and optimizing cash flow. Our Fair Market Value (FMV) lease helps ensure that you have the latest IBM technology and with our mid-lease upgrade capability, you can increase the capacity of the system with little to no change in monthly payments. At the end of the lease, take advantage of our flexible end-of-lease options to fit your changing business needs. IBM Global Financing has the breadth and depth of offerings, longevity, proven success and global reach to help you develop a robust financing and asset management strategy that provides you the opportunity to leverage new technologies and turn your ambitious vision into a tangible solution. Expand your purchasing power—Affordable monthly payments allow you to change the technology acquisition discussion from “what can I afford right now” to “what solution is really right for my business.” IBM Global Financing allows you to expand your purchase power to get you the right solution. Accelerate your project’s cash flow break-even point—Acquire your IBM technology today and begin to realize its benefits now. An FMV lease can help you get the solution you need now, with low monthly payments that better align upfront costs with the anticipated return on investment from the technology. Easy to acquire with affordable rates—We offer one-stop shopping for a total IT solution, so you can acquire IBM hardware, software, services and the financing you need—from one IT provider. Plus, we provide simple, easy-to-understand contracts and quick approvals. As the world’s largest IT financing provider, with an asset base of US$35.8 billion and over 125,000 customers, IBM Global Financing offers highly competitive rates that promote low total cost of ownership and low monthly payments. IBM Global Financing operates in more than 50 countries. Go to http://ibm.com/financing for financing options in your country and to contact a local financing specialist. IBM Global Financing offerings are provided through IBM Credit LLC in the United States and other IBM subsidiaries and divisions worldwide to qualified commercial and government clients. Rates and availability subject to client’s credit rating, financing terms, offering type, equipment and product type and options, and may vary by country. Non-hardware items must be one-time, non-recurring charges and are financed by means of loans. Other restrictions may apply. Rates and offerings are subject to change, extension or withdrawal without notice and may not be available in all countries. Please contact your local IBM Global Financing representative for additional detail.